Mobile suits are the pinnacle of technology in the Gundam universe. But while they may look impressive in the anime, their Gunpla counterparts look rather cartoonish, don’t you think? While Gunpla are made of brightly colored plastic, the anime versions of mobile suits have a metallic sheen to them. They appear to be made of metal ore. What if I told you your Gunpla could look like that, too? I’ll walk you through a simple method of giving your Gunpla what I call a “metallic candy finish,” so it looks just as shiny and chrome as an anime Gundam. There are many ways to achieve a metallic look, but for this tutorial, I will be using an Iwata Eclipse HP-CS airbrush with an Iwata Sprint Jet air compressor spraying at 12-15 PSI. I’ll be demonstrating this technique on the 1/100 Barbatos Lupus. The parts you will see in the photos will be the upper chest, V-fin, and chin. Now, let’s get started. First, apply a coat of primer to your parts. This will help the paint adhere to the surface. We’re using gray as a happy medium, but you could also use black or white. Check out the Gunpla 101 Primer Guide to see why you might use gray over other colors. Before you begin, make sure you have no contaminants on the part (hair, dust particles, etc.) because these imperfections will cast shadows and stand out like a sore thumb, and that would certainly not be groovy. When priming, it’s best to spray in thin coats, gradually making your way to full coverage. This way, you’re less likely to overdo it. Next, we’ll be applying the gloss black base coat. This will add more depth to the eventual metallic outcome, giving it a more full-bodied sheen. Like with primer application, it’s best to spray in thin coats. Only this time, you want to make sure you don’t underdo it. An even layer is important for a nice glossy finish. On this step we will finally be adding the metallic shine, using chrome paint. We do this after applying a gloss black base coat to enhance the sheen of the paint, making the metallic colors shine quite nicely. For Alclad II chrome, it’s best to spray your coats lightly and slowly, taking your time to ensure satisfactory quality. Don’t rush; you’re building a Gunpla, not running a sprint. Use this as an opportunity to appreciate your kit coming to life. Now it’s time for the fun part: color! The whole purpose of making the chrome nice and shiny is so it will shine brightly through the transparent color on top. You can use any transparent colors you please, but for this tutorial, we’re using blue, red, and yellow. Simply spray the transparent color in thin coats over the chrome. Since we’re using transparent color instead of opaque, you gain control over just how bold your colors turn out. Want a light metallic blue? Simply apply a thin coat of transparent blue. A stronger blue? Apply two coats. And so on. Metallic candy finishes can be quite versatile in this regard. Lastly, seal it all in with a top coat. I like to use one of two top coats depending on what condition I want my Gunpla to look like. For a weathered or battle damaged look, I use Alclad II matte top coat. This dulls the sheen we just worked so hard on, but ends up with a more realistic metallic look, like of a machine that has been used a lot. For a pristine look that makes the Gunpla look fresh off the assembly line, I like to use Alclad II aqua gloss top coat. Aqua gloss will give your metallic kit a high shine finish while also making the metallic colors a bit more vibrant. Of course, the choice is up to you. The PG RX-78-2, built by Chris with a metallic candy finish. With a nice metallic paint job, your Gunpla will look just as impressive as the mobile suits in the anime. As you practice your skills, you could even make your kit look hyperrealistic. The possibilities are endless! Happy building and stay groovy! 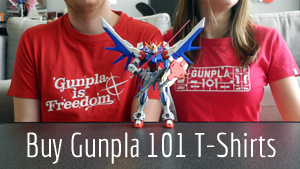 If you liked this tutorial, you can check out more of Chris’s Gunpla builds on Instagram.